You know that awful feeling when you find out that your obsessive crush turns out to be different than you thought? Sure, his looks remain untouched, his voice...his manner, his scheming ways...ah, all the yummy traits you LOVE about him...yes, they're still ALL there, but something is amiss causing you to second guess your lust? Something unacceptable has come between me and my TV crush, "Chuck Bass" from 'Gossip Girl' -- otherwise known in 'real life' as Ed Westwick. It pains me to discover that my Ed/Chuck is tainted...he's not the Brit that I thought him to be and I fear that my cheeky crush will forever be ...contaminated. Right, time for the reveal - the truth that haunts me, makes me queasy...my Ed...is a Chelsea Football Club supporter. Yep, he cheers for Chelski -- and as a die-hard Manchester United gal, well you can guess what that means. Ugh. I wish it was just some rumour posted on Gossip Girl, but it's true...he proclaimed it himself in the UK's Company magazine. Ed...ED! 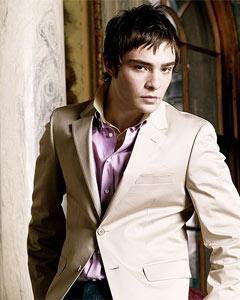 And you showed so much promise, my little Chuck Bass. Now I'll be thinking of you with John Terry and that's just so WRONG! Ooh nooo!! So sorry that your crush had to be ruined by something so terrible!! I always knew there was something not quite right about him. Bloody Chelski!! What is/isn't he thinking?? Tut!